Pandurang Sadashiv Sane, better known as 'Sane Guruji' is known to be an emotional, sensitive freedom fighter. His literature, aimed at educating children, continues to inspire the young and old. Sane Guruji was a great patriot who loved his country with all his heart. 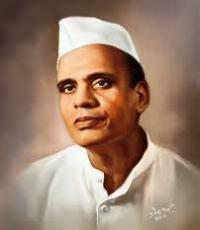 Pandurang Sadashiv Sane was a great and eminent Marathi writer. His greatest story, “Shyamchi Ayi” is biographical and has been filmed in Marathi. He was a student of philosophy, a lover of students, a powerful speaker and a writer of several poems and stories. A freedom fighter who was imprisoned several times, he started a weekly called Sadhana after independence. His major novels are Shyamchi Aai (Shyam’s Mother), Astik (The Believer), God Shevat (Sweet Ending), and a marathi translation of Tolstoy’s book What is Art?, entitled Kala Mhanaje Kay? Guruji’s contribution to children’s literature remains unparalleled to this day. His God Goshti (Sweet Stories) includes simplified and abridged versions of world classics like Hugo’s Les Miserables and Goethe’s Faust. Freedom fighter, follower of Gandhi. He wrote a book titled “Bharati saunskruti.” He worked tirelessly for the welfare of untouchables. The Sadhana weekly, started by him in August 1948 as a vehicle of socio-cultural emancipation, continues to spread his message. Indian postage stamp is issued in his honour.